Combine the butter and milk in a microwave-safe bowl and microwave until hot. Combine the milk mixture with the potato flakes and whisk well. Add a splash more milk if needed; the potato mixture should be more fluid than normal – almost like a very thick cream sauce. Chop the bacon and cook until crisp. Dice the chives, grate the cheese if needed, and get all of the remaining ingredients right ready to go next to the grill. Open the dough and unroll it. Place the dough directly onto the pre-heated grill grate on the hot side. Cook about 3 minutes until very browned, then flip it. Cook a few more minutes to brown the other side, then move the pizza to the other side of the grill where the heat is off. 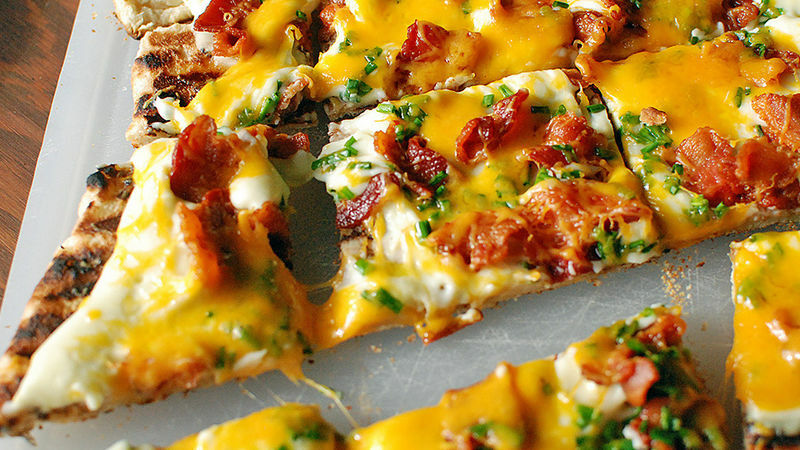 Spread mashed potatoes onto the pizza crust, then top with the bacon, chives, and cheese. Close the grill and allow to cook for about 10 minutes to melt the cheese and warm up the toppings. Remove from the grill, cut, and serve immediately. This grilled pizza has mashed potatoes and all the trimmings ... even bacon! Grilling pizzas is one of the ultimate fun summertime activities for me. It's important to have all of your ingredients outside right near the grill while you cook, so you don't have to run in and out. If you convince your friends to come hang outside with you, you've got people to talk to and help you with the pizza making process (and grab you a beer from the fridge)! Once they see you making the grilled pizzas, they might even want to jump in on the action and make one of their own. It’s one of those cooking techniques that just looks fun and makes you want to do it too. Making grilled pizza is so easy: Just make sure your grill is set up with one hot side and one cool side, and that you have all your ingredients ready within reach. Then pop your crust down on the hot side of the grill. Flip it over and cook both sides nice and brown. Then move it to the cool side of the grill and add the mashed potatoes. These were made with extra milk so they'd be creamy and spreadable like a sauce. The rest of the "loaded" toppings go on next, and then it's just a quick heat on the hot side to melt the cheese. We ate this pizza in minutes! Dan Whalen wants to hydrate his potatoes with all sorts of things now. He has been blogging for over 6 years at The Food in my Beard. Check Dan's Tablespoon profile often to try his recipes with creative international spins!